Şi totuşi – câtor oameni ne-ar rămâne să le dăm bineţe, dacă am exclude persoanele cu HIV/SIDA, foştii deţinuţi, homosexualii, oamenii cu disabilităţi, persoanele în etate, femeile însărcinate, săracii, persoanele de altă naţionalitate şi de altă religie etc.? Fiecare dintre noi, de regulă, facem parte măcar dintr-un grup minoritar, lucru pe care îl conştientizăm dacă ne oferim acele câteva minute de meditare zilnică. Autoaprecierea şi respectiv – acceptarea şi respectarea oamenilor din jurul nostru, ţine de capacitatea noastră de a gândi şi de a analiza lucrurile. Nimeni dintre noi nu este perfect, şi nici nu este asigurat că nu se va îmbolnăvi sau nu va fi judecat vreodată. Am putea descoperi că putem să facem faţă cancerului, tuberculozei sau infecţiei HIV, dar ne-am ciocni de ceva mult mai grav decât orice maladie – discriminarea şi stigmatizarea. Neacceptarea propriei personalităţi naşte complexe grave şi ură. Credeţi că un om care se acceptă şi se iubeşte are nevoie să instige la ură împotriva altor persoane? Dacă acei „formatorii de opinie” din new media care discriminează, spun minciuni şi fac spume la gură blamând, s-ar considera perfecţi sau măcar acceptabili, ar mai avea nevoie să demonstreze că „sunt alţii mai răi, mai jos”? Festivalul Voluntarilor aflat la cea de a IX-a ediţie vă invită duminică, 4 decembrie, să celebrăm pe cei mai buni voluntari ai anului. Evenimentul este organizat cu prilejul Zilei Internaţionale a Voluntarilor şi vine să promoveze activităţile de voluntariat. La eveniment vor participa Preşedintele Parlamentului, Marian Lupu, Ministrul Tineretului şi Sportului, Ion Cebanu, reprezentanţii misiunilor diplomatice şi ai societăţii civile. Ceremonia de premiere se va finaliza cu un concert a formaţiei Catharsis şi interpreţilor Adrian Ursu, Cristofor Aldea Teodorovici, Olia Tira, Pavel Parfeni, Serj Cuzencoff, Cindy Wanda, Laurenţiu Popescu, etc. Evenimentul este organizat de Serviciu pentru Pace şi alte ONG-uri din Coaliţia pentru promovarea legii şi activităţilor de voluntariat, Ministerul Tineretului şi Sportului, Direcţia Generală Educaţie, Tineret şi Sport a Municipiului Chişinău, Agenţia SUA pentru Dezvoltare Internaţională (USAID), FHI 360 şi Asociaţia „Prietenii Copiilor”. The opening ceremony of the Bulgarian National tour stop was officially launched by Deputy Minister of the Culture, Mitko Todorov, Mrs. Deyana Danailova, Cultural Policy Minister, Mrs Irena Karakachanov from the Ministry of Youth and Education and Mrs. Zinaida Zlatanova Head of Representation of the EC in Bulgaria. „The efforts and actions of tens of thousands of volunteers and volunteering organisations in schools, hospitals, nursing homes, elderly homes, libraries, sport clubs, environment actions, have an invaluable contribution to making all our societies better and more human… That is why the European Year of Volunteering aims to draw attention to their efforts and give them well deserved recognition.” – Ms. Zinaida Zlatanova, Head of EC Representation in Bulgaria. The Sofia EYV Tour stop has a distinctly green tint! A team from Bulgaria’s BTV Media group launched a volunteer campaign to call on citizens to get together to clean the country for one day. Young volunteers from the Bulgarian Red Cross surprised the audience by simulating an evacuation and members of the public were invited to attend rescue demonstrations in front of the Palace of Culture. The Bulgarian Tour stop will last three days and concludes on Saturday 26th of November. For the three days, a number of debates and round tables with experts, presentations on volunteering, entertainment, musical activitiesm, games and drawing workshops are planned. On Saturday a closing ceremony is foreseen with the participation of the European Commissioner for International Cooperation, Humanitarian Aid and Crisis Response, Mrs. Kristalina Georgieva. Mrs. Alžběta Brozmanová Gregorová from the Department of Social Work in the Pedagogic Faculty of the Matej Bél University in Banská Bystrica and Mrs Tatiana Matulayová from the Social Work department of the Faculty of Arts of Prešov University were in charge of the latest research on volunteering in Slovakia and had the opportunity to share the results of their work with the EYV Tour participants. The research was part of the national campaign of the European Year of Volunteering and focused on the quantitative and the qualitative aspects of volunteering in Slovakia. 973 Slovak citizens over 15 years old were interviewed and filled in a questionnaire. This methodology produced some interesting statistics: in the last 12 months 27.5% of the population took part in volunteering activities through a volunteering organisation. This classifies the Slovak Republic with an average level of involvement in volunteering in Europe. 47.1% of the population are involved in non formal volunteering which means that they help others but who are not part of an organisation. In Slovakia involvement in non formal volunteering rather than formal volunteering is characteristic as it is the case in most of European countries, however both types are connected. A high number of volunteers involved in formal volunteering are also active in non formal volunteering and vice versa. Slovak volunteers are men and women from all backgrounds who equally get involved in volunteering throughout Slovakia. The least involved age group are 15 – 19 year olds. The survey also showed that the higher level of education received the higher the involvement in volunteering, with this in mind University students and working citizens are the most involved. The salary is an important factor, but it doesn’t mean that the level of involvement in volunteering increases proportionally to the height of salary. The most involved citizens are those whose salary is between 600 and 900€ per month. Slovak religious groups also play an important part in volunteering and become more active in non formal volunteering while the formal volunteering attracts believers and non-believers equally. Slovak Volunteers participate in many diverse activities in many different places. The majority of formal volunteers – 56.3% – are active in non-profit and nongovernmental organisations where 25% cooperate with an organisation managed by a regional or local administration. The most frequent area of volunteering is social services followed by environment, art and culture, sports, church related activities, children and youth organisations related activities and charity. The most frequent non-formal volunteering activities are carried out in the household, property maintenance, pets, taking care of children, etc. The main reasons that motivate Slovaks to volunteer are based on values: the importance of helping others, social interaction, wishing to meet new people via volunteering and establish new friendships. The main barrier surrounding volunteering is threefold: the lack of information available on volunteering, those in need do not ask for help, and a lack of time. There were also interesting statistics on the benefits of volunteering? 92.9 % of the participants from the survey answered that the main reason is that they like what they do. Other important benefits are the satisfaction of carrying out work, broadening of experiences, personal growth, acquiring new skills, etc. Nevertheless experiences gained during volunteering activities are still not understood as transferrable into professional life and development. Those and other statistics were discussed during a very interesting presentation. 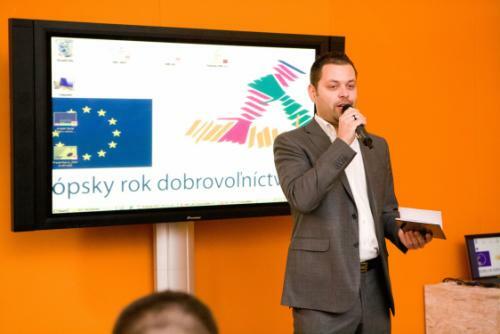 The Slovak EYV Tour opening was held on the 15th of November in the Ministry of Culture and offers a busy agenda of debates, workshops and entertainment. Mrs. Eva Masárová, director of the Youth Department of the Ministry of Education opened the session and expressed her wish that the tour will motivate more people to become volunteers, especially the younger generation. Mrs. Andrea Elscheková – Matisová, head of the EC Representation in Slovakia, underlined the importance of Voluntary work. She explained that the objective of the European Year of Volunteering and of the European Years in general is to raise awareness amongst the general public, experts and politicians and establish a basis for long term positive trends. The Slovak EYV Tour is supported by the Mayor of Bratislava. Michal Feik, his advisor, shared with the public several successful volunteering initiatives that have been promoted by the municipality such as cleaning the city by volunteers before the ice-hockey world championship, or a citizen initiative that managed to stop the demolition of PKO ( a famous cultural center). Participatory budget is another initiative where citizens have the opportunity to intervene on a voluntary basis. They can decide on how one percent of the municipality budget will be used. Gabriela Gliševičová, from the Slovak Youth Institute and the National coordinating body for the European Year of Volunteering, made a short overview of the activities that have been undertaken throughout the year. 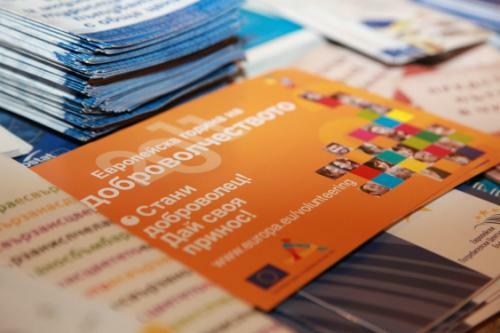 The objective of the EYV in Slovakia was twofold: research on the volunteering situation in Slovakia on one hand and a communication campaign on the other hand. The research was done in collaboration with experts from the Matel Bel University in Banská Bystrica and the Prešov University and ran during May and June 2011. It showed that volunteering is quite frequent fenomenon among Slovak citiyens. According to the study, 27,5 % of the population is involved in „formal volunteering“ which means voluntereing in a context of an organization. In the meantime, 47,1 % of citizens are involved in „non – formal volunteering“ which means helping other people outside the family and not organized via an NGO or similar organization. At the end of the session a relay was handed from the organizors of the EYV to the National coordinator of the following European Year which will be dedicated to active ageing. Mrs. L’Ubica Zajacová from the Directorate General of Human Rights and Equal Treatment made a short introduction of the activity plan for next year. During the next five days the Slovak Tour will offer a lot of activities, workshops and debates related to different volunteering areas such as: volunteering in art and culture, youth, corporate, healt and prevention, leisure and social inclusion. A number of cultural activities will accompany the tour. In total 37 organizations are involved in the program. VOLUNTARI DIN CADRUL COMPANIEI GAS NATURAL FENOSA MOLDOVA AU PLANTAT ARBORI ŞI AU FĂCUT ORDINE ÎNTR-UN PARC DIN CAPITALĂ. Acţionând în spiritul angajamentelor asumate în cadrul reţelei locale a Pactului Global în calitate de întreprindere responsabilă social, încercând prin efort şi exemplu propriu să contrubuie la aducerea în ordine a oraşului în care activează compania şi locuiesc angajaţii săi, un grup de voluntari din cadrul Gas Natural Fenosa Moldova în coordonare cu responsabilii întreprinderii municipale pentru întreţinerea spaţiilor verzi a desfăşurat sâmbătă, 5 noiembrie, curent, o acţiune ecologică în parcul din sectorul Râşcani al municipiului Chişinău. 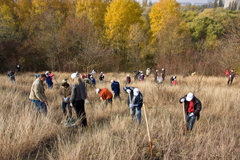 Circa 60 de voluntari au plantat în parc 350 de piueţi de frasin şi au adunat gunoaie. În rezultat, sectorul parculului de lingă strada Studenţilor, repartizat de întreprinderea spaţiilor verzi pentru desfăţurarea acţiunii „ O toamnă curată cu Gas Natural Fenosa” , a redevenit graţie efortului voluntarilior, parte a naturii îngrijite de om. Conform participanţilor la acţiune, urbea şi zonele verzi din cadrul ei, suferă de pe urma nepăsării şi neglijenţei multor persoane, care aruncă iresponsabil tot felul de deşeuri menajere în parcuri şi lasă în urma contactului lor cu natura semne ale unui comportament necivilizat. Despre intenţia desfăşurării acţiunii respective administraţia Gas Natural Fenosa Moldova a informat Ministerul mediului şi Primăria municipiului Chişinău, asigurând oficialităţile că fac acest lucru voluntar, în beneficiul naturii. Asemenea acţiuni voluntarii de la Gas Natural Fenosa Moldova desfăşoară anual şi nu doar în municipiul Chişinău, dar şi în alte localităţi din zona sa de activitate.